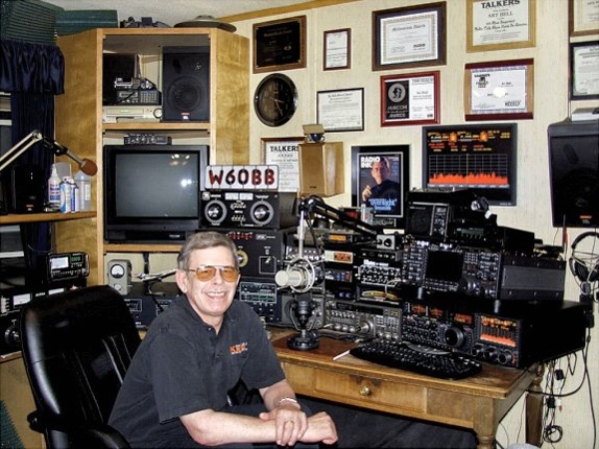 Well-known and sometimes contentious radio host Art Bell abruptly announced he would no longer host his popular show last week after a series of alleged events occurring at his home have left him and his family fearing for their safety. Pahrump resident Bell called the incidents, which apparently involved the use of a firearm, “never-ending terrorism” in a Facebook post shortly after the latest incident that took place last week. With all the alleged incidents, Bell has found it tough to sleep through the night, with the worry of additional occurrences taking place. So until someone is caught or something comes to light in the investigation, Bell is putting his radio show on hold. According to a pair of release by the Nye county Sheriff’s Office, they have been unable to verify any of these claims and currently consider the investigation closed. According to Bell, it all started on Oct. 21 when a neighbor down the street from Bell’s residence reported hearing several shots and a vehicle driving away, but did not see anything in the area. The reporting person said that when they went to the area they found a fresh beer, police said. When sheriff’s deputies responded to the area they were unable to locate anything regarding this event, according to their report. The next day on Oct. 22, Bell called the sheriff’s office because he was on the air and a neighbor advised him about the shots being fired. Bell stated he did not see or hear anything and was simply advised by the neighbor. About a month later on Nov.19, Bell’s producer called police to report that Art had received a call from a blocked number saying that if he went on the air that night he and his family would be dead, according to the sheriff’s office. Deputies spoke with Bell and he said that he had received the threatening phone call and did not want to report it but he did want it documented. A few days later on Nov. 24, Bell contacted the Nye County Sheriff’s Office to request extra patrols during the nighttime hours after he reported that a male was on his property the night before and was kneeling down by his window. Sheriff’s deputies have carried out extra patrols in the area of Bell’s home and have not been able to locate anyone in the area. Bell explained that his property borders land owned by the Bureau of Land Management, so that creates problems as far as people having access to his land. The latest incident occurred on Dec. 9 when dispatch received a 911 call from Bell’s wife, stating that Bell was walking outside on his property when he had called her from his cell phone to tell her someone had shot at him and then he stopped responding. Deputies responded and upon checking the area, Bell was found lying on the ground of his property with no injuries. He told responding deputies that he was not sure if the noise he heard was a firework or gunshot, according to the sheriff’s report. Deputies did an extensive check of the area and didn’t locate anyone and also did not discover any evidence of gunshots. “They didn’t find any brass, but it was somebody out on BLM land, so I don’t know how they would find it,” Bell said. “I’m convinced it was a .22. I heard a pop sound and somebody yell, ‘You were,’ and I couldn’t hear the rest because I hit the dirt and called my wife, who called the sheriff. The sheriff’s office maintained extra patrols in the area for the rest of the week and did not discover anything. At this point, the investigation is closed unless further information is discovered, according to the police report. Although there are no suspects in the alleged incidents, Bell said he has an idea who it might be, but did not disclose the person. He did give an idea as to why someone might target him for such attacks. “There are people who get annoyed because I do shows, for example I had the leader of the devil worshipers on, I have people talk about ghosts, I have people talk about all kinds of things,” Bell said. “It’s hard to know what offends someone, but when you talk to enough people, you’re going to always offend somebody.